Looking forward to supporting CBL in promoting the Digga brand of attachments to complement their current range. Digga is the leading manufacturer of pendant mounted auger drives and trenching machines and CBL now exclusively supply Digga auger and trenchers from all its centres. Founded in Brisbane, Australia in 1981, and opening a UK centre in 1998, Digga is privately owned and manufacture quality attachments from five company owned facilities globally – in Australia, the United States, and Europe. Digga have a solution to all your attachment needs and to suit most machine types. Digga's products provide users with quality, versatility, competitive pricing, and factory backed warranty. Digga's new generation premium auger drive range is the ultimate in performance, quality, and cost effectiveness. Over 30 years of design and development has produced the highest quality range of earth drills on the market today to suit excavators, backhoes, and skid steer loaders. Completely manufactured and assembled by Digga, using only the highest grade materials and strictest quality control. They are fitted with Digga-designed Eaton bell motors with integrated pressure relief valve and input housing. The innovative design allows the gearbox to go down the hole to maximise drilling depth without extensions, eliminating downtime and minimising maintenance. Backed up with industry leading warranty and European factory backup, Digga planetary auger drives are ideally suited to drilling and augering applications in most ground conditions. All Digga augers are built from high grade steel and feature ideal flight pitches and advanced cutting head design providing superior drilling performance. Digga trenchers for excavators, skid steer loaders, and backhoes are manufactured in-house to the highest industry quality. An Eaton motor and Digga-made gearbox ensures reliability and performance with the peace of mind you expect from a Digga product. Three different chain options are available for trenching in different ground conditions from general earth, rocky ground, concrete, and asphalt, to frozen ground. Bigfoot Trencher - Features a single spoil auger and depth control foot. Hydrive Trencher - Features a unique drive system which allows for more usable horse power, providing greater efficiency. The trencher also has twin spoil augers to remove spoil more efficiently. The hydrive is for serious trenching. If you have a lot of trenching to do or it's your business, the Hydrive trencher is your best choice. 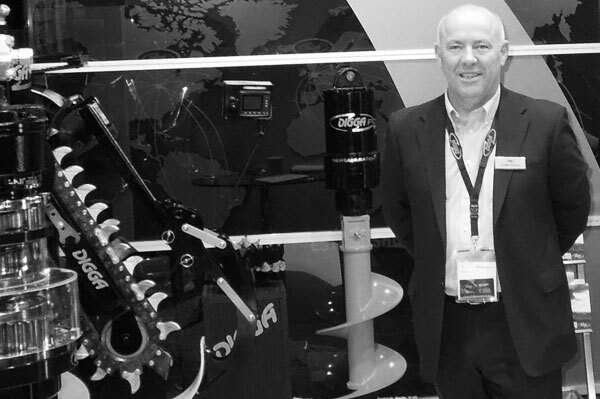 Eddie Charity, General Manager of Digga Europe, comments, "Digga Europe are excited with the opportunity in being given sole supplier status to CBL Ltd. We are looking forward to working closely with CBL in supporting them to promote the Digga brand of attachments to complement their current range."